Welcome to our review of the Nikon P–300 BLK 2–7x32mm BDC SuperSub Riflescope. This scope is designed for the .300 AAC Blackout, a relatively new ammunition cartridge capable of shooting subsonic or supersonic ammunition. The .300 AAC Blackout has become extremely popular in hunting feral hogs with AR-platform rifles, but does the P–300 BLK meet such a demanding purpose? Let’s check it out and find out for ourselves. What Are The Scope’s Dimensions? This model is built around a 32mm objective lens, with an overall length of just 11.5 inches. It’s about average in weight, just an ounce over one pound. Surprisingly, the eyepiece is 44mm in diameter, so it very well might require a medium-profile set of rings for mounting. You would think the scope’s eye relief would be pretty long, given the diamter of the eyepiece, but that’s not the case. You will only have 3.8 inches between your eye and the scope, so bear that in mind if your rifle has a fair bit of recoil and/or you wear glasses. The objective lens’s exit pupil is a wide 4.6mm to 16mm. How Much Magnification Do I Get From The P–300 BLK? Here’s another area where Nikon has skimped a bit. The total magnification of this scope ranges from 2X to 7X, even though the scope is advertised as being good for long-range shooting. I suppose it is still good for such situations, as long as you are targeting larger objects than feral hogs. The clarity, crispnes, and contrast through this scope are quite simply out of this world. The images are HD quality, putting you so up close and personal with that hog that you might worry about it charging you even from 100 yards away! How Is The Optics Quality On The Riflescope? These optics are fully multicoated, allowing for the maximum possible light transmission. As previously noted, the contrast and image clarity in the sight picture are both superb. The quick-focus eyepiece puts you sharply on-target both easily and rapidly. The BDC SuperSub reticle wired into this scope provides you with open circle aiming points at 100-yard increments out to 600 yards. For even more fine-tuning on your shot, additional hash marks are included at 50-yard distances. My only real complaint here is that the reticle isn’t illuminated. What’s The Light Gathering Capability Like On The Scope? Nikon advertises the transmittance of this scope as being 98 percent, which is higher than the theoretical maximum brightness of 95 percent. I’m almost convinced the manufacturer is right, because there is so much brightness through this scope even during low-light conditions. How Wide Is The Field Of View? For spotting and tracking that wild boar, the P–300 BLK’s 12.7 to 44.5 foot field of view at 100 yards will more than suit your needs. How Easy Is The Scope To Mount? 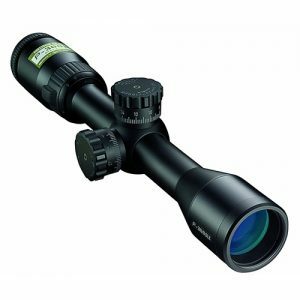 Nikon doesn’t include scope rings in the box, so make sure you buy a pair before you start mounting your scope. With the proper rings, however, it’s an easy job. Any Tricks Or Tips About Mounting The Scope? The only tip I can offer you is, as previously noted, make sure you buy the rings before you make your purchase. I used the Nikon P-Series Picatinny Mount on my AR rifle, and it worked flawlessly. How Easy Is The P–300 BLK Riflescope To Sight In? Nikon excels at making sighting in your scope an easy, and even fun, process. Start off by using a laser bore-sighting tool to get you on paper, then head out to the shooting range to fine-tune your adjustments. The hand-turn windage and elevation controls have clicks you can hear and feel, and move the reticle by 1/4 MOA per click. Total adjustment range is 80 MOA, giving you plenty of room to play with. Unfortunately, the parallax is fixed at 100 yards. There isn’t any way to adjust this, so keep that in mind if you perform much in the way of longer-distance shooting. How Durable Is The Scope? The lenses are O-ring sealed, and the optics chamber has been nitrogen-purged. This provides you with a scope that is both waterproof and fogproof. It’s also shockproof, and covered by Nikon’s limited lifetime warranty. Thanks for checking out my evaluation of Nikon’s P–300 BLK 2–7x32mm BDC SuperSub riflescope. This is a fantastic scope for moderate-range shooting using the .300 AAC Blackout cartridge, either with supersonic or subsonic loads. Unfortunately, it does suffer a bit from short eye relief and a non-illuminated reticle, and it’s difficult to use at ranges beyond 200 yards. Other than that, this is a real winner.